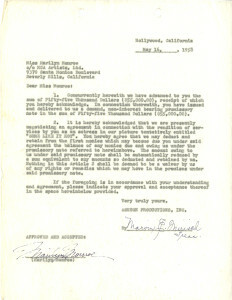 Carbon Typscript, Signed in ink, one page, quarto, May 16, 1958, or an advance for “Some Like It Hot.” The contract is between Marilyn Monroe (represented by MCA Artists) and Ashton Productions. The advance is for $55,000. 1. Concurrently herewith we have advanced to you the sum of Fifty-five Thousand Dollars ($55,000.00), receipt of which you hereby acknowledge. 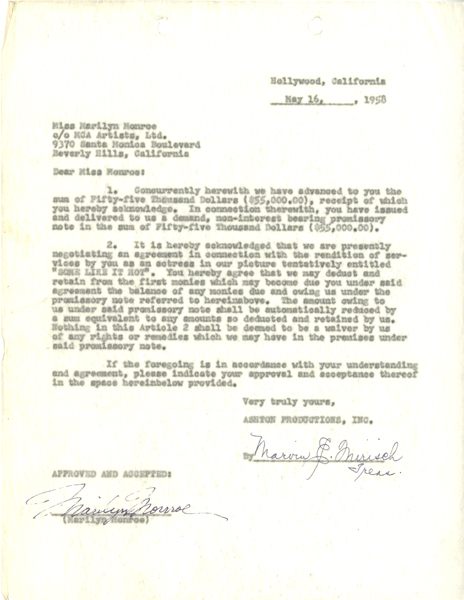 In connection therewith, you have issued and delivered to us a demand, non-interest bearing promissory note in the sum of Fifty-five Thousand Dollars ($55,000.000).